This is an adaptation to AIR ZOOKA DUEL, but allows for more students to get involved and ups the strategy a little bit. 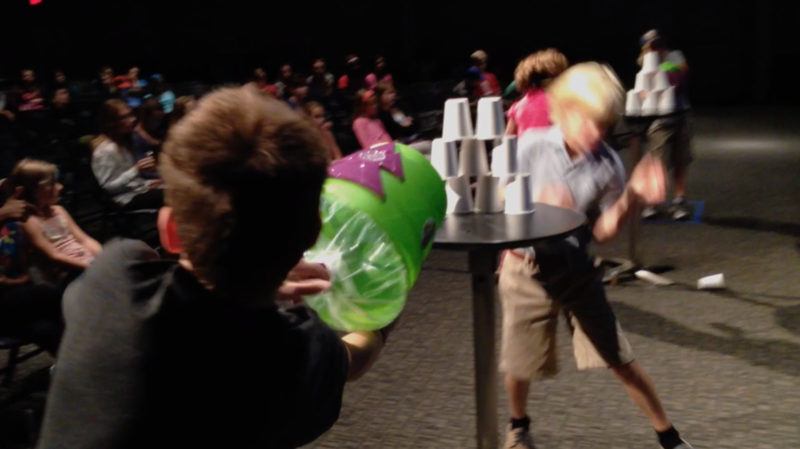 Try and keep as many cups stacked on the table as possible, while someone else is shooting them down as soon as you put them down. It gets pretty interesting! 1. Air-Kazooms. We got ours from amazon for about 20 bucks each. Check them out HERE! But, if you don’t want to spend money for the same kind of a game, get a couple of members from the church to bring their leaf blowers. You could have each student stand on either side of the stage; that would be awesome! 2. Styrofoam Cups. You will need 10 for each team but keep some extra on hand! 3. A table. Set your cups up on this of course. 3. Tape. Tape some lines for the students to stand behind! Set up your table with a stack of 10 Styrofoam cups! This is a base of 4 cups. 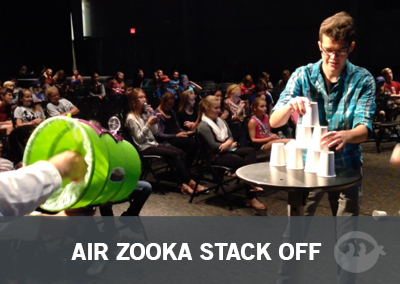 Tape out your line that the students must stand behind when using the Air Zooka’s! You will have two people on each team. One to shoot and the other to re-stack. Team 1’s shooter will go against Team 2’s stacker and vise versa. 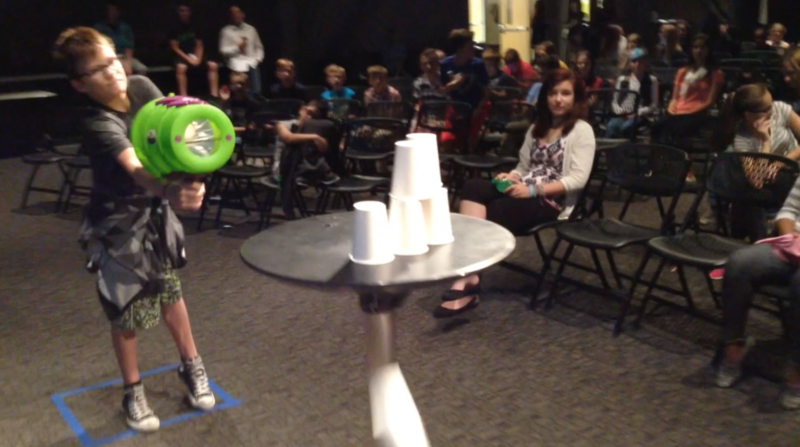 Team 1’s shooter is looking to shoot down all the cups on the table while Team 2’s stacker will try and re-stack all the cups back on the same table. All this is happening while Team 2’s shooter is doing the same thing with Team 1’s stacker. 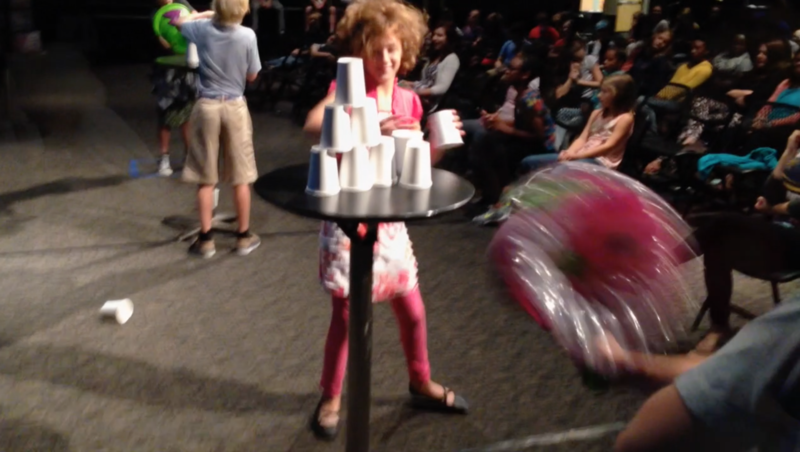 At the end of 60 seconds whichever team was able to re-stack the most cups is the winner.